How could it be that scholarship programs – not just providing tutoring or textbooks, but completely changing children's schools – could have such small impact? 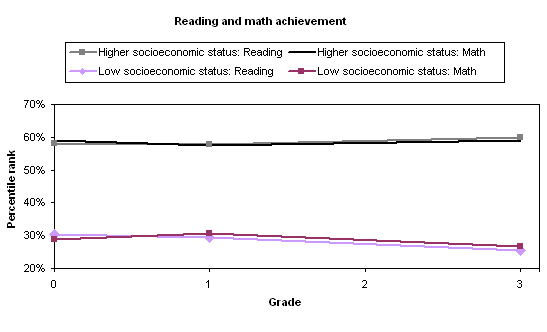 The answer, in my view, has a lot to do with where the achievement gap really comes from. I'd always assumed that low-income and high-income children enter school on roughly the same footing, and that low-income children fall behind as time goes on. In fact, the gap between high-income and low-income children is large starting the day they enter kindergarten, and grows only slightly afterward. I now believe that early childhood care programs may be a lot closer to the roots of inequality than any school program – no matter how well-intentioned and how well-run. This doesn't mean there's nothing to be done or gained from education programs. I believe that some, such as KIPP, are able to get unusual results from unusual approaches. But I also believe that any program addressing K-12 education as the key to inequality should be treated with skepticism, until and unless it can produce measurable results. In my experience, most such programs can't.